Machine learning is a phenomenon which is gradually becoming an inevitable tool for most of the large companies. You must have heard about Al algorithm of Google which beat the world Champion in Go and other technologies like RankBrain but unlike them, machine learning is not a mystical subject which is relegated to the domain of math researchers. There are many technologies and libraries which can be approached for getting data to play with. Machine learning has the capability of turning traditional website marketing and SEO. 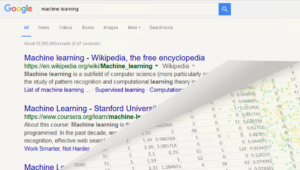 It was in 2015 that an experiment was started where they threw several machine learning algorithms with the goal of predicting Google ranking. The result gave them 41% true positive and 41% true negative data. Towards the end of 2015, they started hearing more about machine learning and its resolution to use large amounts of data. The more they dug in, they saw it become more technical and soon they knew that they could do a lot if someone could help them navigate through the right path. It was then that they came across Alejandro Simkievich, a brilliant data scientist and he was already working in the areas like conversion rate optimization and search engine relevance. Once they joined hands with Alejandro, they became adamant on using data in order to seek help with decision making for SEO. Machine learning fundamentally is using computer programs to use data and transform it into a way which offers something really valuable in return. The main point is that machine learning gives you something valuable with any type of input data. They found out data that they could use to train a machine learning model. Since they were not sure about what would be useful for them, they adopted the kitchen-sink approach and grabbed as many features as they could think of. Majestic and GetStat were extremely valuable in supplying the base data and hence they could build a crawler which could capture everything else. Gradually they realized that in terms of Google ranking, something that matters the most is whether or not the given site ends up on being ranked at the first page of a specific search term. What if they tried to anticipate whether the site would end up in the top 10 sites ranked by Google? They continued to experiment with such factors and later emerged successful.